For Cyrille Domoraud, the 2006 World Cup represented both the greatest triumph and most difficult challenge of his career. In late 2005, Domoraud, then a 34-year-old fullback from Côte d’Ivoire (Ivory Coast), captained the Elephants’ national soccer team to its first-ever World Cup berth, a historic event that prompted a temporary ceasefire in the nation’s six-year civil war. But Domoraud rode the bench the first two games—close losses to Argentina and the Netherlands—before getting a red card in the Elephants’ final game, a win over Serbia and Montenegro. Earlier in his career, Domoraud might have called the whole episode bad juju. As a native Ivorian, Domoraud grew up in a culture steeped in witchcraft. As a young player he used to wear a good luck ring—one of many talismans he owned, some of which he received from his parents—in the hopes of currying spiritual protection and fending off evil spirits. But thanks in part to the faithful witness of his sister, Domoraud became a Christian in 1999 and eschewed his superstitious upbringing. By then, his impressive playing career was in full swing. After starting with several French clubs from 1992 to 1999, he spent a season with Italian Serie A giant Inter Milan in 1999-2000 before playing with teams in France, Spain, Turkey and, finally, his homeland. His last professional season came in 2008 with Africa Sports Abidjan. Since retiring, he has devoted more time to his Cyrille Domoraud Training Centre in Abidjan, which has produced, among others, Ivorian striker Wilfried Bony of Swansea City (English Premier League). 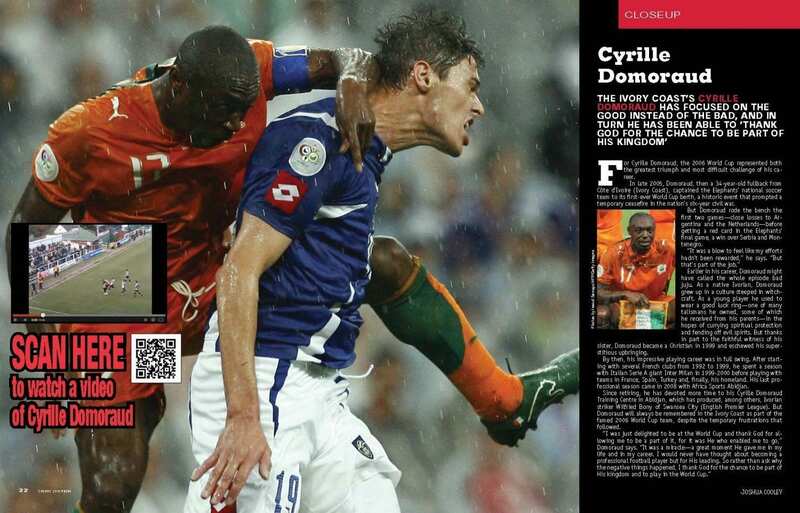 But Domoraud will always be remembered in the Ivory Coast as part of the famed 2006 World Cup team, despite the temporary frustrations that followed.